We travel the Valley reaching out directly to business owners, listening to their challenges and future plans and connecting them to the resources they need. As the partners in the Phoenix Forward initiative have recently eclipsed 2,000 total visits helping Phoenix area businesses expand, connect to resources and navigate regulations and policies, it’s worth noting the numerous successes empowered by strong collaboration between the four partners: the Greater Phoenix Chamber of Commerce, City of Phoenix, Maricopa County and the Arizona Commerce Authority. Working together enables us to achieve far more than any of these entities could alone. Not only does it allow us to assist more individual businesses, but this collaboration lets us use the group’s collective knowledge and access to resources for the benefit of each business any one of us visits. • Helped one company expand, which started a relationship that ultimately led to a locate by a sister company. This was also a good example of facilitating collaboration between entities outside of Phoenix Forward. The list goes on, but the results speak for themselves. As we discuss with our partners the insights we’ve all been gaining from visiting businesses, business owners time and again tell us that they simply aren’t aware of the numerous programs available to assist them from organizations including the Chamber, City of Phoenix, Maricopa County and Arizona Commerce Authority. “Companies large and small can benefit from our help, but often haven’t identified how best to engage when considering expansion. We are here to support company leaders and provide a guiding hand, while remaining keenly focused on identifying solutions that impact the bottom line to help them grow their businesses,” said Geoff Shumway, Vice President of Business Expansion for the Arizona Commerce Authority. Our collaborative data also shows the top issue for business owners in the Greater Phoenix region is access to and connecting with a qualified workforce. Business owners appreciate being extended a line of communication, even when they don’t need assistance. Christine Mackay, Director of Community and Economic Development for the City of Phoenix, says companies appreciate outreach from the city, because some have never had any public agency reach out and make them feel like a part of the community. “Even if there are no services needed from the meeting, the city has built a strong relationship with a company believing if it has needs, someone at the city cares,” Mackay said. Visited companies give the partners high marks. “The City of Phoenix business retention and expansion efforts paid off with a deal,” said one technology company. “The city’s BRE team has been instrumental in making our relocation to our new headquarters on Grand Avenue a seamless transition, all while helping us introduce ourselves to the city of Phoenix and beyond,” said a company relocating its headquarters. While all partners in the Phoenix Forward initiative have varying reach and different experiences, the one thing binding all of our efforts together is a love for our community and strong desire to help businesses succeed and grow the economy. Contact any of these professionals to schedule a visit and start growing your business today. 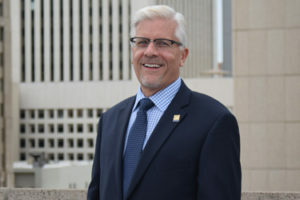 – Greg Tilque is Senior Economic Development Manager for the Greater Phoenix Chamber of Commerce.